Here's a video clip from Logan "@LoMoMarlins" Morrison and Bryan Petersen's (he's a Marlins player, I think) new reality bro show. 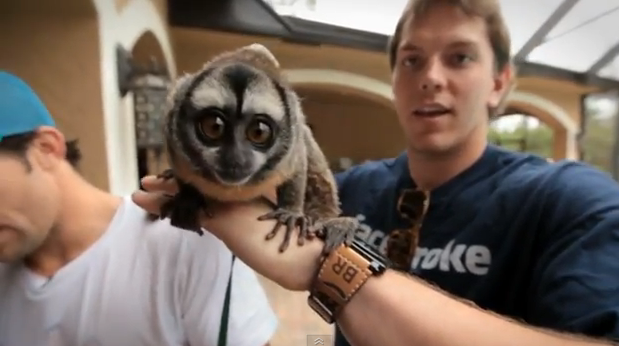 Anywho, this is totally relevant for two reasons 1) because in the trailer for the show you'll notice LoMo wearing a ZWR shirt (2010 vintage "Facebroke"), and 2) he's holding a zoo animal! And HEY, SPEAKING OF T-SHIRTS, SARGE: ZWR t-shirts are 15% off (only until March 5, so hurry!) if you spend $30 or more. Just use the code "CLEARWOODER" at checkout. If you're wondering how LoMo got that t-shirt in the first place, it's because I mailed it to him two seasons ago after he literally broke his face. It's totally not shocking that he's still wearing it out in public almost two years later, because as we all know, ZWR threads are timeless treasures of the highest quality.